Timimoun is a small oasis town of 30000 inhabitants in central Algeria. It lies in the Gourara region, south of the Grand Erg Occidental desert at an altitude of 288 metres. 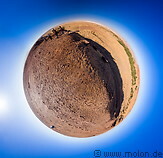 It is along the Trans-Sahara highway, a paved road connecting the mediterranean coast with southern Algeria, and is connected by paved roads to Ghardaia and Bechar. The urban centre of Timimoun itself doesn't have much in terms of attractions: there is a mosque, a cultural centre, a main road with shops and some restaurants. 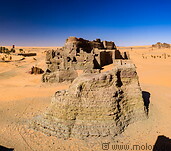 The reason to visit Timimoun is the desert landscape around it, which consists of rocky and sandy desert and some oases and ancient villages. Some people in Timimoun are black, the descendants of African slaves of the past when Timimoun was a slave trading centre. 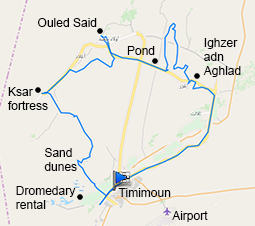 Tours across the desert start and end in Timimoun. In the map to the right, the blue line represents the desert tour we did in one day (77km in total). Starting from the hotel we initially drove to a ridge in the desert from which there was a good view of the desert and the oasis. After that we stopped at the ancient Ighzer adn Aghlad village, then continued to the ruins of a ksar, an old desert fortress. 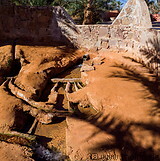 We then drove to the oasis around the Ouled Said village. 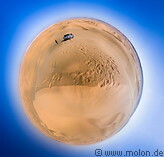 Before driving to the sand dunes area west of Timimoun we stopped at another desert fortress. Finally, before getting back to the hotel, the driver brought us to a dromedary rental place. Timimoun is accessible by car or bus and has an own airport. There are a few hotels in Timimoun, but only the relatively upmarket Gourara is bookable through the international hotel booking portals.